Former Charlton midfielder Neil McCafferty has joined League 2 side Rushden and Diamonds on a two year contract. He was on loan at the Irthlingborough club for the latter part of last season and won many friends among supporters of the Team in White. I had a drink with him after one game at Nene Park and it was clear that he had settled in well, although he was still living in London at the time. Some of the Addickted have expressed the view that we should not let our young players go so early, but I watched him in several games at Nene Park and while he could cut it at that level, I did not think he had Premiership potential. That's not to say there's nothing in the story, but clearly a signing is not imminent. Portsmouth have confirmed that they are interested in signing unsettled Addick Jason Euell. Agent Tony Finnigan has confirmed that Pompey is a likely destination. He said, 'They are interested in Jason and I would love to get him down there because it is a great place to play.' The fee is said to be £1.5m, less than the amount offered by Palace mid-season. Euell was a £4.75m record buy from Wimbledon four years ago, but his last start was in the FA Cup victory against Rochdale on 8 January. He scored only two goals last season, but didn't have many opportunities. Some of the Addickted think that he has never been the same since he was absused by fans in the car park, an event that led the club to introduce new security measures for players. Whatever the truth of the matter, it is time for him to move on both in his own interests and that of the club, even though the Bloke Beside Me will be sorry to see him go. And no doubt he will score for Pompey on his return to The Valley! I was at a meeting on the 25th floor of Millbank Tower yesterday. Great view down the river and over London, similar to that from one J Archer's pad but 'he's lower down' it was pointed out to me. When I got there the view was obscured by a heat haze and I couldn't see the Dome or Shooters Hill. But by the time I left three hours later it was as clear as bell and I could see the water tower on top of the hill. Where's the Charlton content in this? Well in a way it's a kind of analogy for the present transfer situation at The Valley: shrouded in mystery. This is exemplified by the discussion going on among the Addickted about Lee Bowyer. Is he no saint, but worth it for his footballing abilities? Or is he such a great footballer as is made out? And so on. Whether he is heading for The Valley, despite his rejection of Birmingham (by a small majority of fans some of whom were Villains in my view) remains a matter for speculation. Similarly, we have seen Fish leave, but no one has come in for Euell whose wages would be worth saving. And what happened to the stories of Jeffers going to Wigan? I'm not saying that the club is to blame for the lack of action. One can just imagine the scenarios. Player A wants to come, but his wife doesn't want to move south. Player B is interested, but then his agent puts in a wages demand that Richard Murray thinks the club can't meet. No doubt Curbs is beavering away and getting somewhat frustrated according to some accounts, helped as always in these matters by Keith Peacock. But it would be nice to see another signing soon. The Addickted have not been heartened by reports linking the club with Manchester City left back Ben Thatcher. He is no spring chicken and it is doubtful whether he would be a suitable replacement for Paul Konchesky which is where the reports come from. The Irons have also been linked with Thatcher, but there is no particular indication that he is unsettled at City or that the Massives want to get rid of him. However, he might want to return to London. If Konchesky did go, then the Herminator surely remains first choice left back. Some of the Addickted think that he did not have a good season. All his efforts meant that he had a poor end to a season when he picked up an injury. But most of the time he was one of our better players. So if Konch does go, and I very much hope he does not, the club could be imaginative in its replacement strategy. Addicks defender Mark Fish has been given a free transfer. The 31 year old Springbok has never looked the same since a freak accident in March of last year when he fell through a glass coffee table at home. Certainly he has looked too slow for the Premiership and even looked out of sorts when he played what was to be his last game at The Valley in the reserves play off final. Feesh was known for writing poetry and his love of red wine and has talked about a possible future in South African politics. But for the time being a Championship club looks likely. His departure emphasises the need for Charlton to buy a central defender. West Ham and Fulham are said to be in a battle to sign Paul Konchesky who is reportedly available at what I would regard as a bargain £1.5m. It is difficult to give much credence, however, to reports that he is 'out of favour' at The Valley. That was true during his long stay at Spurs. But he has won his way back into the hearts of the Charlton crowd with his commitment and skill. There may be something in claims that Konchesky favours a regular left-back position which has been denied him at Charlton by Hermann Hreidarsson. In any event, I would be sorry to see him go and I think that is true for most of the Addickted. Other rumours suggest that as part of a new sponsorship deal, 'The Valley' is to have a new commercial prefix in its title. The value of shares in Charlton soared today as the club announced a major new share issue. In heavy trading the value of Charlton shares went up 31.48% to a mid-afternoon price of 35.5p. The club has announced that it is to issue £5.5m worth of new shares. A large tranche of the shares is to go to Derek Chappell who is to join the board. He can claim to be Charlton through and through as his grandfather was a supporter, his father went to the 1947 Cup Final and he has been a season ticket holder since the 1960s. The additional funds could help to finance ground expansion plans if they are approved by Greenwich Council which in turn would generate more revenue to buy higher quality players. The planned signing of Gonzolo Sorondo from InterMilan is reported to have run into work permit problems. The Uruguyan defender was on loan to Palace last year and would have shored up the Addicks' central defence. However, the number of games he has played for Uruguay may have fallen below the level required for a work permit. Curbs is said not to be a happy bunny. Speculation that Damien Francis may be about to leave Norwich for the Addicks has been renewed. The powerful midfielder would certainly fill a gap in the Charlton squad. However, he would also be able to return to the capital by joining Fulham who have money in the bank from the sale of Edwin Var der Sar to the Salford Red Sox and also expect to benefit from a move by Luis Boa Morte. Chris Coleman is said to be willing to splash out more than the rumoured £4m on offer from Charlton. Coleman has also been continuing his interest in Paul Konchesky who would be a real loss to the club. Most of the Addickted will not be too disappointed as they did not seem to be too impressed by Stead. As one wag said, 'Why would Curbs want a striker that can't score? We've got enough of those already?' A midfielder who can win the ball and hold it up and a central defender are higher priorities. Richard Murray will have to redouble his efforts. Charlton are in a bidding rate with Sunderland for Blackburn's England under-21 international Jon Stead. Rovers have already agreed a fee with Sunderland for the striker, but the Addicks are still in the frame. Stead is still away on holiday in the moment and will not make a decision until he is back, so there will be no definite news until later this week. The agent of Newcastle youngster Darren Ambrose has urged Charlton to come in with a bid for the player. The 21-year old midfielder, who formerly played for Ipswich, impressed recently at the Toulon Under-20s tournament. He has been disappointed by the lack of first team action at St James' Park and is said to be interested in joining the Addicks. Charlton's 100th birthday on 9th June saw the foundation of the first Supporters' Trust at the club. The trust sees itself as part of the nationwide movement of supporters' trusts. Charlton Athletic Independent Supporters' Trust (CAIST) has been created to act as 'an independent organisation to represent the views of Charlton fans and support the continued growth and development of Charlton Athletic FC.' One might infer that a possible implication is that CASC has not been representing the views of fans. CAIST will initially be led by Glynne Jones, a former CASC activist who runs the unofficial Addicks mailing list. 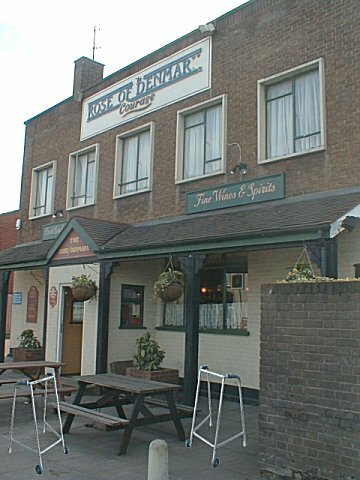 It is understood that further information can be obtained at a 'haddock and chips party' being held at the Rose of Denmark pub on the Woolwich Road on Saturday June 11th. A well-known Charlton author may be in attendance. Temporary headquarters of the new Supporters' Trust? Quite how the Trust will develop and what role it plays remains to be seen. It may, however, be seen as a 'fronde' from a club perspective. It would be unfortunate if it was just dismissed as 'unmutual' as it has some positive aspects, not least the potential for reining in those members of the board who do not seem to fully understand the nature of the Charlton project. However, there is no doubt that Richard Redden, who is understood to be closely involved, is a controversial figure at the club and among its fans. Charlton are interested in Cardiff City centre half Danny Gabbidon. Cardiff are desperate to find funds to rebuild their squad and there is believed to be a price tag of £1.5m on the Welsh international. His fee could be more covered by the £2m Fulham are said to be prepared to offer for Jason Euell. Birmingham City have now lost interest, but West Brom are reported to be poised to make a bid, so it is far from certain that we will see the first Welsh international at The Valley since Johnny Robinson. What is clear is that the Addicks had to do something to plug holes in their defence with Chris Perry nearing the end of his career. Charlton are also reported to be interested in Blackburn striker Jon Stead. Charlton were 13th in a league table based on total wages and salaries in the 2003-4 season according to the latest football finance report from Deloitte. Given that they finished 7th that season, they had the second best positive relationship between wages and league placing of any Premiership club. Birmingham came first and Leeds United and the Massives had the worst relationship. Charlton had a total wages and salaries bill of just under £30m, a 27 per cent increasing on the preceding season. This was the biggest percentage increase in the Premiership apart from Chelsea and the promoted sides. What is evident from the report is the growing gap between the top sides and the rest. Chelsea's wage bill (and this was the season before last) was four times that of Charlton. Manchester United, Arsenal and Liverpool had wage bills that were over twice as large as that of the Addicks. Former Charlton striker Matthias Svensson has left Norwich to take up a three year contract in Sweden. The 31-year old will no doubt be planning for a life after football in his native country. Although not a great goal scorer for Charlton, his uncompromising approach won him fans and he received a warm reception when he came on against the Addicks at Carrow Road earlier this season, going on to score the winning goal for the Canaries. Deano is likely to stay at The Valley after Manchester United signed 34 year old Edwin van der Sar from Fulham as their back up goalkeeper. This is good news for the Addickted as although Stefan Andersen is clearly very talented he is still relatively unproven and battle hardened. The departure of van der Sar is not good news for Fulham. In my view he has been one of the key factors in keeping Fulham up in the Premiership in recent years. There is no doubt that the level of complaint about various matters from Charlton supporters has increased over the last year. There is far more grumbling than when the team was putting in mediocre performances in the first division. And it's not just perennial moaners like the Bloke Behind Me whose main pleasure in the week is to slag off his own team. Nor is it more recent supporters. A lot of the complaints are coming from longer term supporters who put up with much worse in the first division. So what are the main complaints and do they have any substance? Or is it the case, as has been suggested in the media, that Charlton is becoming a moaners' club? This is a frequent complaint with the proposed solution being that Curbs leave and be replaced by ... er. Gordon Strachan used to be mentioned, but now he has gone to a club big enough for his talents. Never mind that Curbs is a greatly respected manager who is highly regarded by the media and football generally who think he has achieved a great deal on a small budget. But the real problem here is the 'as far as he can' phrase. Just how far can a club the size of Charlton go? The harsh fact is that modern football is a business and there is a rough and ready relationship between how much income a club is and where it is in the leagues. Good management can help a club to punch above its weight and that is what Charlton is done. Where the moaners do have a point is when they make the more constructive suggestion that the coaching team might be strengthened, perhaps by bringing in someone with experience of foreign football. Yes, there is a greater distance between the club and the fans, but how do they expect a club in the Premiership to be run? If anything, the club could be criticised for relying too much in the past for people whose main qualification was that they were Charlton fans (this is not a reference to Rick Everitt who did a first rate job as communications manager). Sometimes the club could improve the style of its communications. Not everything has been handled well, although mistakes can be made in any organisation. I would support the right of the club to defend its integrity against repeated accusations which it regards as ill founded. I did think that at one time in the season Peter Varney started to talk down to the fans which was quite surprising given that I believe him to be a genuinely fan friendly person. But this tendency disappeared. We have to remember that the players are hired hands. As Andy Hunt, a player for whom I have a great deal of time, once pointed out the average player will play for at least four clubs during his career. Commitment and effort may get you somewhere in the old first division, although even there you need some talent. 'Killer' was never a great one for effort, but he could suddenly appear and bang in a lethal shot. What we need is more talent not more commitment. We were losing a lot of matches until we switched to 4-5-1. The real problem here is with the structure of the Premiership which encourages defensive play because the financial penalties of relegation (or even losing a place) are so great. The remedies being considered by Premiership bosses are not likely to have much impact without tackling the financial aspect. Curbs is quite cautious and that is both a strength and a weakness. Sometimes I think that we leave substitutions too late. One point I would agree with the moaners about is that we should someone up the field when we are defending a corner as we have no outlet and as a result the ball is played back in to create renewed danger. The problem that the supporters' director faces is the way in which her role constrains her. She is bound by the requirements of board confidentiality. The one time I contacted her by E mail she responded promptly and helpfully. But she is really a 'Ombudsperson' rather than a decision maker. CASC does function largely as a travel club. But if people want it to change, they should get involved. Like many voluntary organisations, it relies on a diminishing band of stalwarts. Yes, there is a problem, but I think that it is largely one of expectations which (as in so many areas of modern society) are unrealistic. There is still a lot to be proud of at Charlton and every hope that the club can continue to progress, albeit it at a slower pace than most people would like. But the risk of dwindling support is a real one. I do not have any magic solution. Indeed, I think that Richard Murray, Peter Varney and the board have a very difficult job to do and I would not like to be in their shoes. Premiership chairmen have voted down a proposal by Charlton that would have redistributed television revenue to help poorer clubs. They won support from Birmingham City and Everton among others, but the majority voted against. Reports suggest that the club is nearer signing Liverpool's Vladimir Smicer.